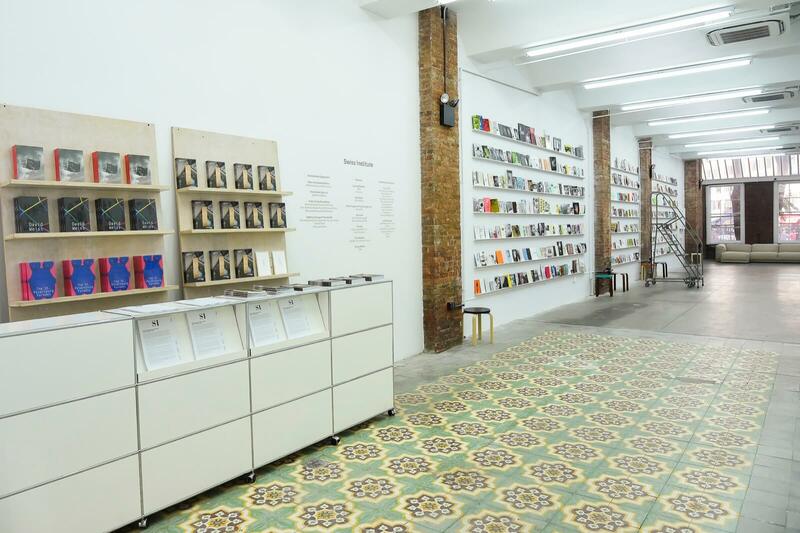 In August 2016, Swiss Institute will temporarily move into a 5,000 sq ft project space at 102 Franklin Street in Tribeca, where the organization will present its programming under the name Swiss In situ. 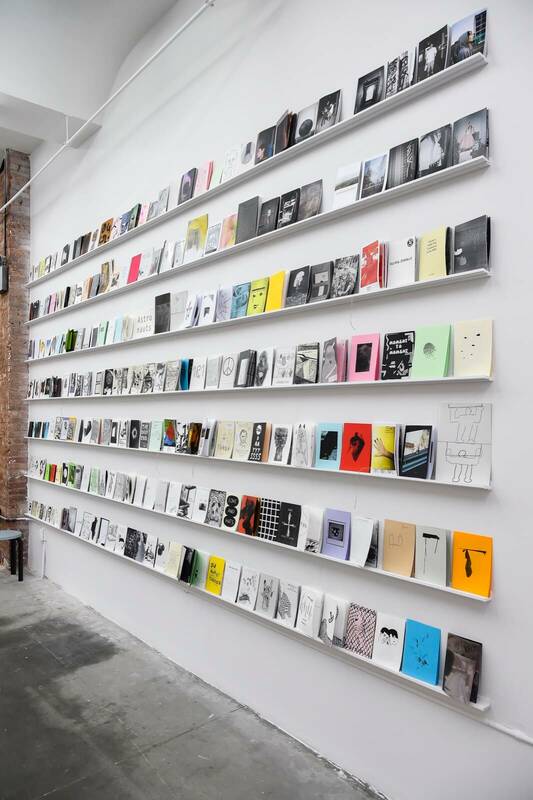 During this period of transition to a new long-term location in 2017, exhibitions and public programs will be focused on temporary structures – including publishing formats, social experiments and architectural forms – set against the fast-mutating landscape of downtown Manhattan. 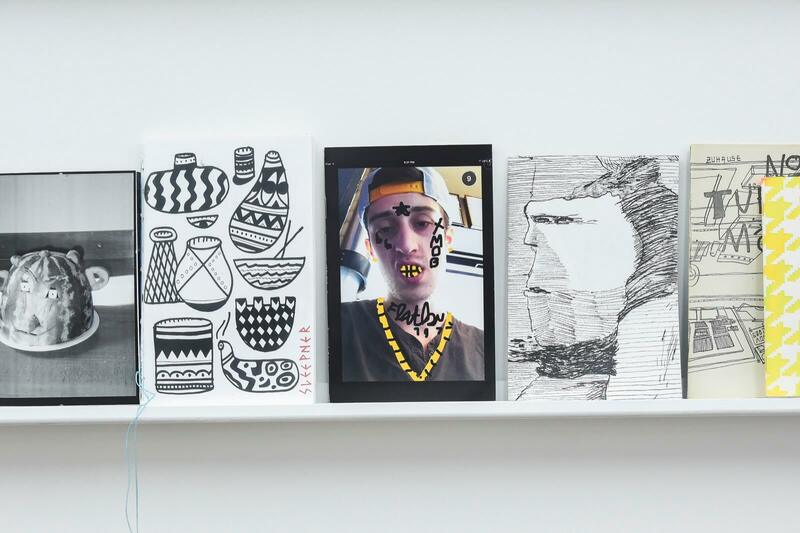 Expanding upon the success of Swiss Institute’s ONE FOR ALL series, which offered emerging artists a first institutional exhibition in the US, Swiss In situ will present new systems of research and production to New York audiences. 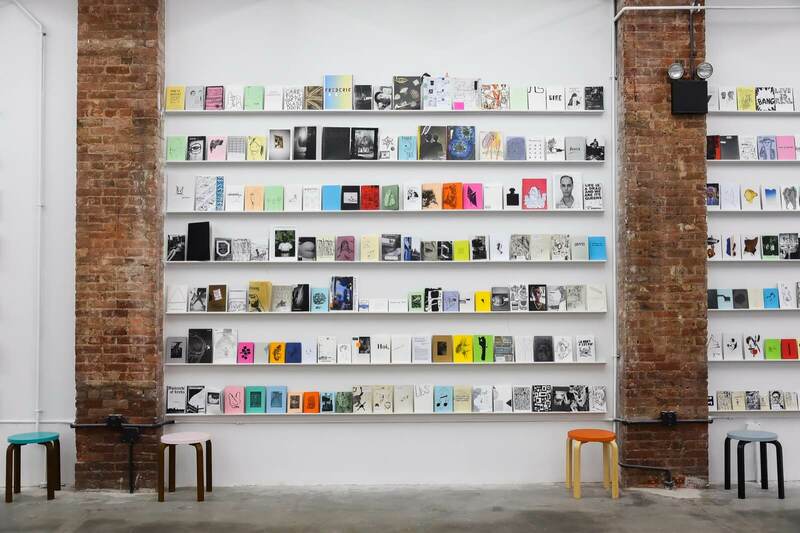 For Swiss In situ’s very first installation, independent Swiss publishing houses Nieves and Innen will bring their focus on artist-made zines to NY with a presentation of the hundreds of pocket-sized, image-based publications they have commissioned over the past 15 years. 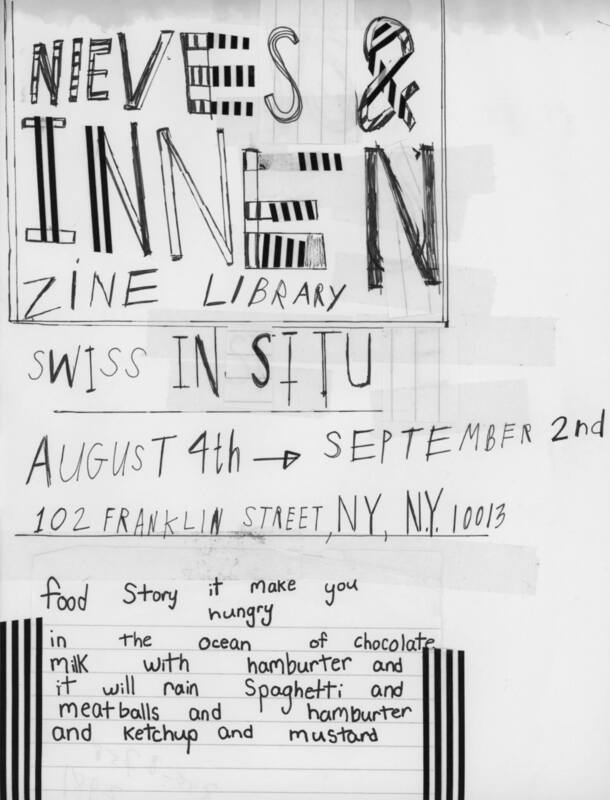 In light of the social and community-oriented nature of zine productions, Nieves and Innen have also invited a group of international collaborators and like-minded producers to exhibit their work as part of the library and to speak in workshops and artist talks about their publishing practices. 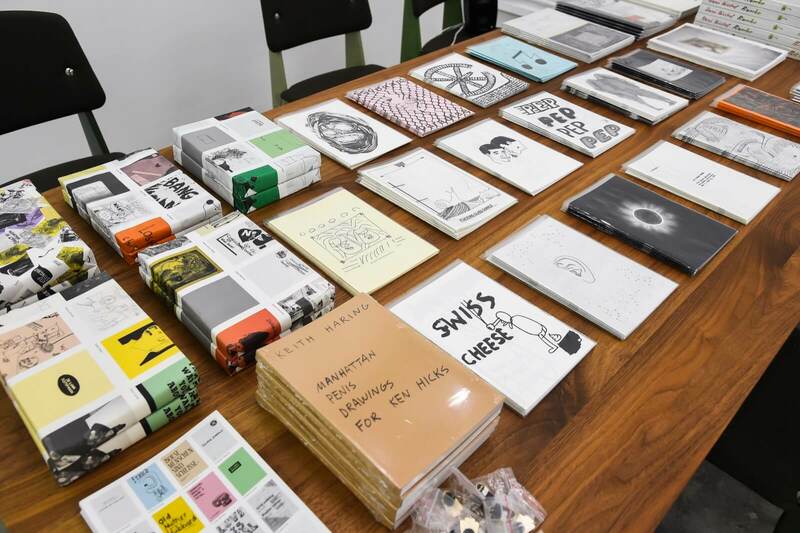 Founded in 2001 by publisher Benjamin Sommerhalder, Nieves is a publishing house based in Zürich that specializes in artist books and zines. 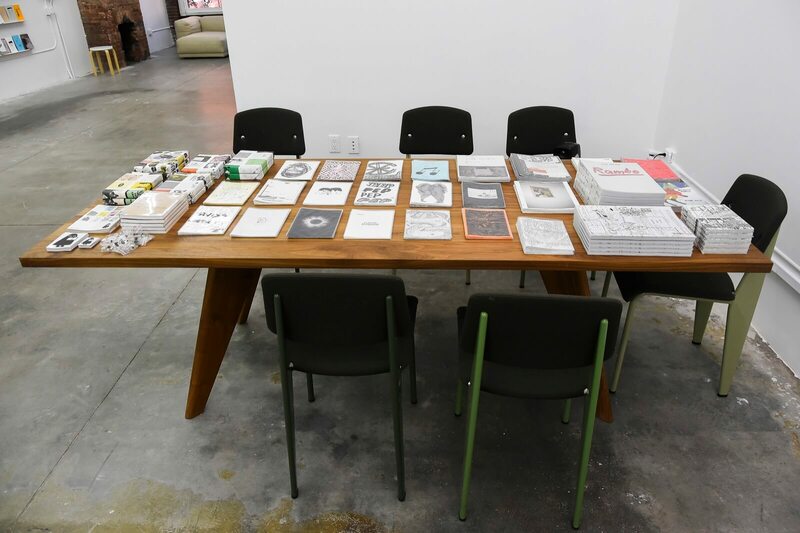 Nieves publications have been exhibited at Kunsthalle Zürich, Kunstverein Hamburg, Art Metropole in Toronto, Printed Matter in New York, and Centre Culturel Suisse in Paris. 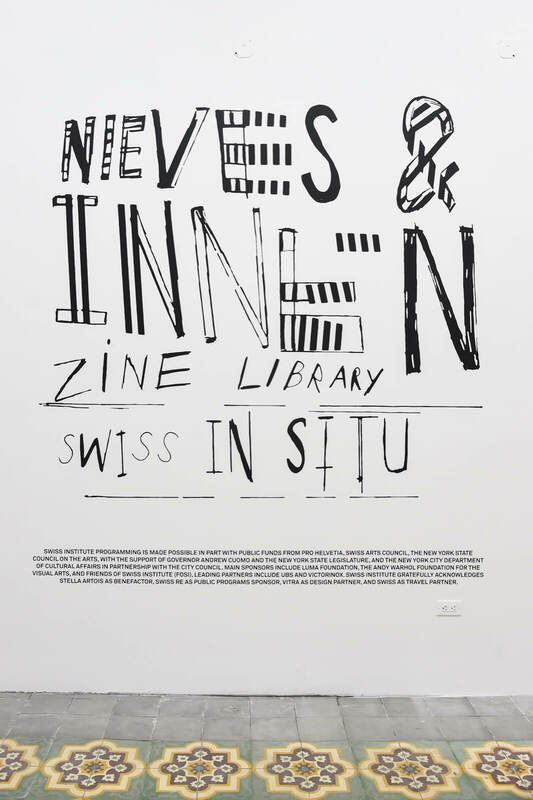 Innen is an independent publisher promoting Swiss and international contemporary artists, founded by graphic designer Aaron Fabian in 2006. 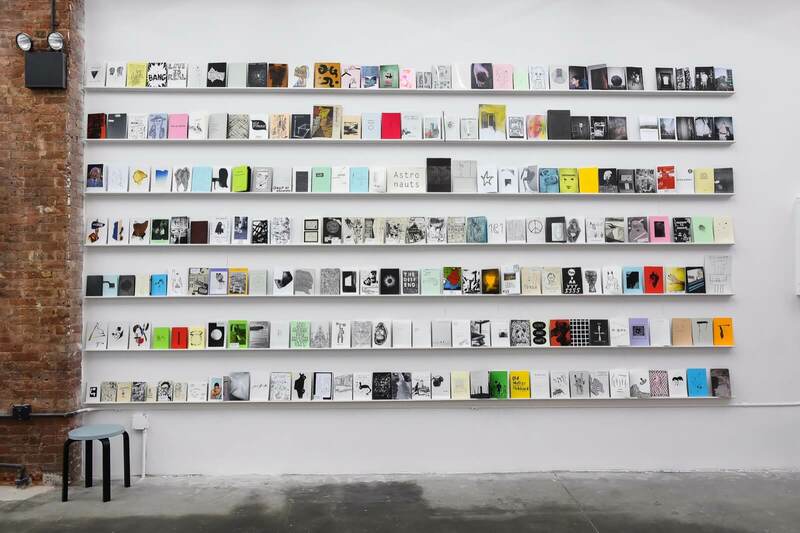 In 2010 Innen launched Zug Magazine, a biannual collection of selected contemporary artworks. 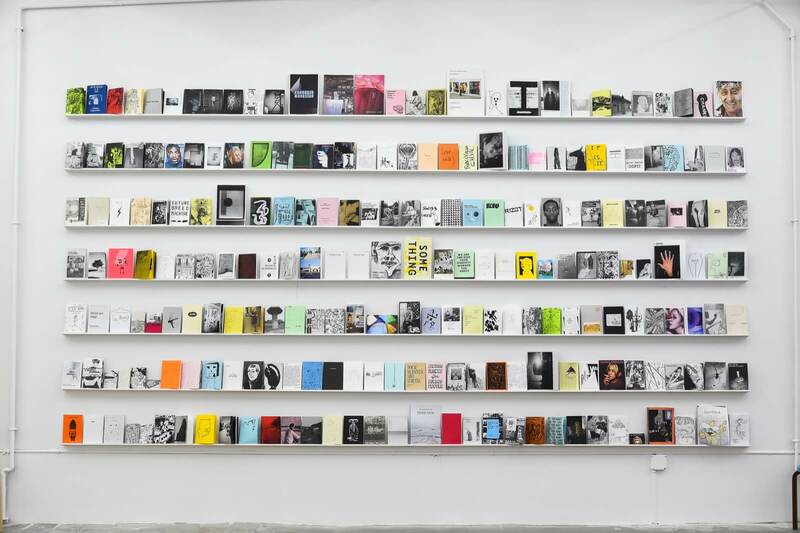 Contributors to the library include Adrien Horni (Turbo Magazine), CH; Aidan Koch, US; Andrew Jeffrey Wright, US; Anne Käthi Wehrli, CH; Ari Marcopoulos, US; Asher Penn, US; Beni Bischof (Laser Magazin & Others), CH; Chihoi Lee (nos:books), HK; Edie Fake, US; Emmanuelle Pidoux (Les Editions du 57), FR; Eunice Luk (Slow Editions), CA; Frédéric Fleury (Les Editions du 57), FR; Hayan Kam Nakache (Tobby Landei), CH; Hendrik Hegray (Nazi Knife), FR; Ingo Giezendanner (Grrrr), CH; Jason Polan, US; Jocko Weyland (Elk), US; Jonas Delaborde (Nazi Knife), FR; Josse Bailly (Tobby Landei), CH; Ken Kagami, JP; Leon Sadler (Famicon Express), UK; Lukas Zimmermann (Marsplastik), CH; Masanao Hirayama, JP; Massimiliano Bomba (Rawraw), IT; Mehdi Hercberg (Shoboshobo), FR; Misaki Kawai, US; Nicole Bachmann (Me and My Friends), CH/UK; Noah Lyon (Retard Riot), US; Panayiotis Terzis, US; Philippe Desarzens (Side Issues), CH; Rachel Domm, US; Remio (Sleepner Zine), NO; Robin Cameron, US; Son Ni (nos:books), TW; Stefan Marx, DE; Stéphanie Gygax, CH; Susan Cianciolo, US; Tauba Auerbach (Diagonal Press), US (list in formation). SWISS INSTITUTE PROGRAMMING IS MADE POSSIBLE IN PART WITH PUBLIC FUNDS FROM PRO HELVETIA, SWISS ARTS COUNCIL, THE NEW YORK STATE COUNCIL ON THE ARTS, WITH THE SUPPORT OF GOVERNOR ANDREW CUOMO AND THE NEW YORK STATE LEGISLATURE, AND THE NEW YORK CITY DEPARTMENT OF CULTURAL AFFAIRS IN PARTNERSHIP WITH THE CITY COUNCIL. 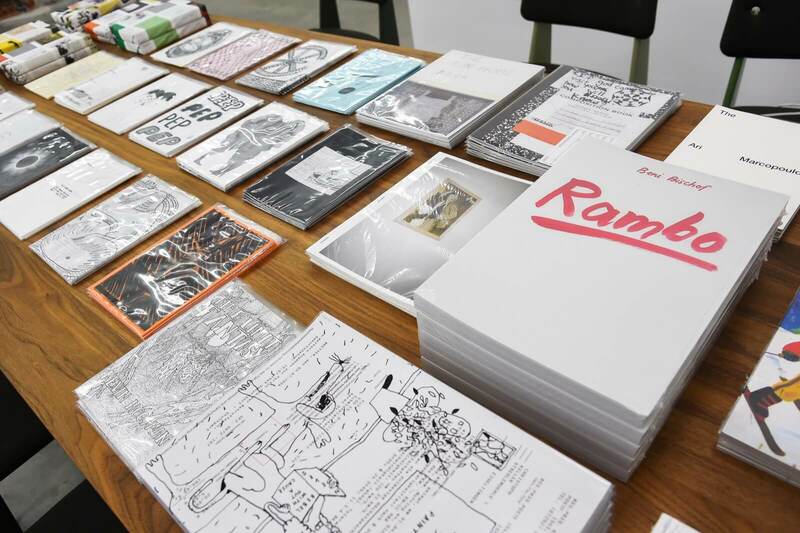 MAIN SPONSORS INCLUDE LUMA FOUNDATION, THE ANDY WARHOL FOUNDATION FOR THE VISUAL ARTS, AND FRIENDS OF SWISS INSTITUTE (FOSI), LEADING PARTNERS INCLUDE UBS AND VICTORINOX. SWISS INSTITUTE GRATEFULLY ACKNOWLEDGES STELLA ARTOIS AS BENEFACTOR, SWISS RE AS PUBLIC PROGRAMS SPONSOR, VITRA AS DESIGN PARTNER, AND SWISS AS TRAVEL PARTNER. Image credit: design by Susan Cianciolo. 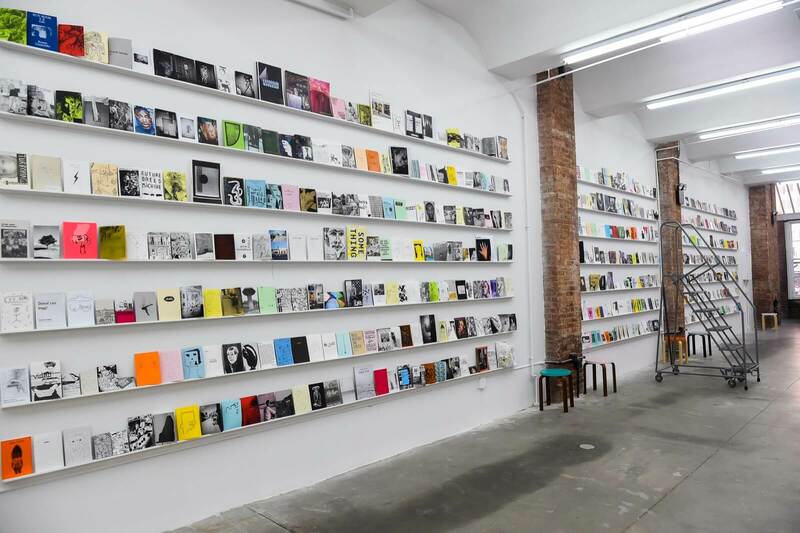 Nieves and Innen Zine Library, installation view.